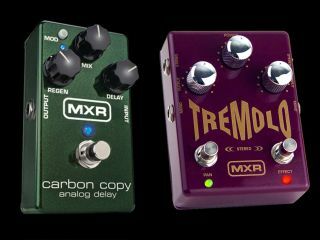 MXR has announced two new pedals, the MXR M-169 Carbon Copy Analog Delay, and the MXR M-159 Tremolo, based on Dunlop's TS-1 tremolo. The MXR M-169 Carbon Copy delay pedal has a completely analogue signal path, which MXR promises will give "rich, warm delay - made possible only by old-school bucket brigade technology." Maximum delay time is 600ms, an impressive amount for an analogue unit, and it boasts five controls that give control over delay time, mix, repeats, and modulation rate and width. It's also true bypass. The MXR M-159 Tremolo is a stereo tremolo. It retains the sounds and intensity, shape and speed controls of the original TS-1, but fits it all into a box with a much smaller footprint. MXR claim it produces a "rich and clear signal without any excess noise." The pedal features two inputs (for either true stereo or two different instruments), and two footswitches: an on/off and a 'pan' switch. The pedals are available from April 2008. The RRP for the delay is $150; the price for the tremolo hasn't yet been announced. More details are available on the Jim Dunlop website.